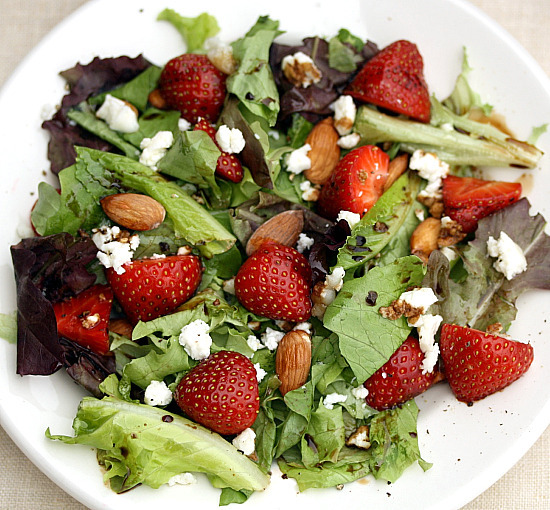 On individual serving plates, arrange lettuce, raspberries, starwberries, blue berries, and almonds as desired. Drizzle with Buttermilk Thyme Dressing. Serve immediately. In a small bowl, wisk together buttermik, sour cream, lemon zest, lemon juice, olive oil, thyme, sugar, salt, and pepper. Store in an airtight container in the refrigerator for up to 1 week. End.